This Schlage Plymouth Single-Cylinder Bright Brass Keypad Entry with Knob features an adjustable bolt that resists kick-ins to protect your home. The handleset's backlit, programmable keypad allows for keyless entry. Easy to set up and use, it comes complete with a 9-Volt battery, installation hardware and two keys. 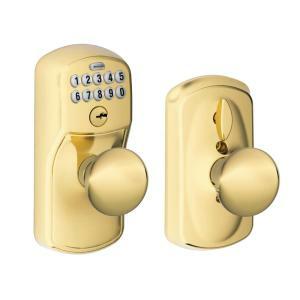 Tbook.com crawls the web to find the best prices and availability on Locks and related Tools and Hardware products like Schlage Plymouth Bright Brass Keypad Electronic Door Knob Featuring Flex Lock. For this page, related items include products we find that match the following keywords: "Lock" at our vendor partner Home Depot. Schlage Plymouth Bright Brass Keypad Electronic Door Knob Featuring Flex Lock is one of 147 Locks and related products listed in the Tools and Hardware section of Tbook.com If you have any questions on this product, please give us a call at 734-971-1210 during the hours of 9am - 5pm EST for assistance. Thank you for shopping at Tbook.com, the Internet Department Store!